Diode lasers slowly became the most commonly used lasers in dentistry. FDA first approved them over 20 years ago. Since then there has been a great advancement in technology. Each year different brands present new, better lasers that make the work of dentists much easier. Plus, they provide a better experience for patients when they visit the dental office. Lasers are definitely a better option compared to conventional dental treatments and procedures. Among the many advantages, you will find less to almost no pain, quick procedure, less bleeding, faster healing process and more. Diode lasers are available in wavelengths from 800 through 1064 nanometers. The ones that feature 810nm are the most common ones. They can literally be used in every single field of dentistry. This is a brand new laser type that has a great use in many different fields of dentistry. It was constructed for an odontological application. It makes the job of our dentists much easier and your experience much more pleasant. Just like any other laser the pain is almost completely done. The procedures are done with just a little bit of anesthetic. The bleeding is literally minimal and the healing process is very fast. There is no need for stitches. 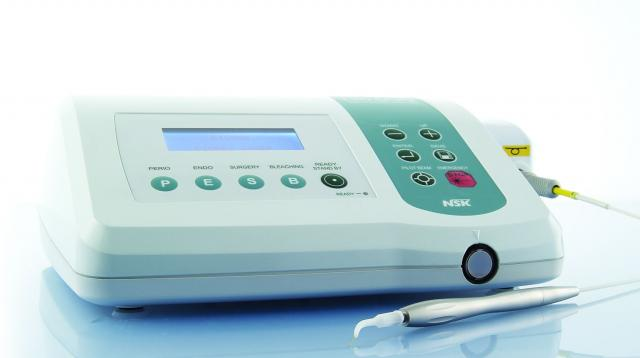 The NSK Dio 500 laser is ideal for soft tissues. Thanks to the many advancements in dental technology, with this laser dentists, can perform many procedures in oral surgery such as tongue and lip straps, stimulating treatment, use it in endodontics, conservative periodontics, abscess incision, frenectomy, gingivectomy, bleaching, mouth ulcers, peri-implantitis, hemostasis and more. These lasers have active mediums that involve gallium, arsenide, and aluminum. They have a great effect on tissues that contain a lot of pigments, collagen, hemoglobin, and melanin. That is why diodes are very successful in treating soft tissues. These tissues highly absorb the wavelengths and that is how the laser carries out its effect. The diodes are cleared for the following procedures: excising, incising, coagulation, ablation. They can be used in two modes, the first one is continuous waves and the second one pulsation. The first mode is usually applied for most surgical procedures, while the pulsed mode for procedures that require a lot of accuracy and control. Diode lasers find their use in oral surgery, pediatric dentistry, orthodontics, endodontics, general dentistry, periodontics and more. The FDA has already approved a large number of procedures that can be performed with these lasers. Among them you will find: teeth whitening, diagnostics of dental caries, pulpotomy, decontamination of root canals, aphthous ulcer treatment, herpetic lesion treatment, coagulation, reducing the bacterial levels and treating inflammation, removing coronal pulp, detection of subgingival calculus and more. This is a diagnostic measure that helps dentists located caries and subgingival calculus. For this purposes, they usually use a diode laser with a wavelength of 655nm. A lot of people are affected by periodontal disease. Pocket cleaning, scaling and root planing is very commonly used procedures in dentistry. Diode lasers can be of great help in this field. The whole point is to remove all the harmful bacteria and granulation tissue present in the pockets. That way the tissue will get a chance to heal. Bacteria such as Prevotella Intermedia and Porphyromonas Ginigvalis are just a part of the pathogens that cause this disease. Thanks to diode lasers they can be effectively destroyed. Dental offices use wavelengths between 810 and 980nm. The pathogenic bacteria absorb the laser waves and that is how they are destroyed. The laser penetrates deep into the tissue and has an immense effect on treating the disease. After the treatment dentists note a drastic reduction in the numbers of bacteria. 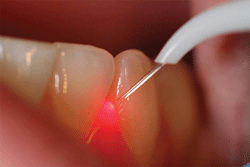 Diode lasers are also commonly used in decontaminating root canals. The whole procedure is much easier, the patient doesn’t feel almost any pain and is not stressed. Dental aesthetics today is more important than ever. A lot of patients come to the dental office asking for the perfect smile. For those who are not happy with how their gums look there is a procedure named gingival contouring. With this type of treatment, professionals reshape the gingival tissue in many different ways. Some patients are experiencing hyperplasia of the tissue. That means that there is extra soft tissue surrounding their teeth. In some cases, it can even cover them. The best treatment option is to reshape the gums and make them look great again. Diode lasers are very useful for this procedure. If the doctors do a surgical procedure where they excise the extra tissue with a scalpel, the healing process can take a long time. Plus, there is a lot of blood that can impair visibility. There is also a chance of post-operative infection and pain. With the laser, they avoid all of these unwanted effects. The healing time is extremely fast, there is just a slight discomfort and the patient doesn’t go through the trauma of seeing blades. 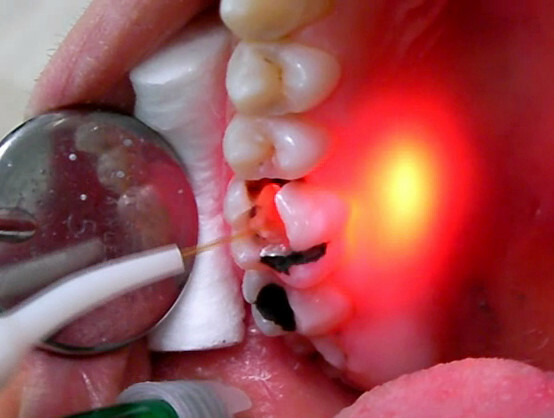 Diode lasers are very useful in dental surgery. Among the many procedures available, dentists usually use them for gingivectomy, frenectomy, vestibuloplasty, operculectomy, uncovering unerupted teeth and more, removing tissue around implants, treating lesions such as fibromas, ranulas, mucoceles and more. These lasers are a much better option than conventional surgery. There are less bleeding, a faster healing process, and less post-operative pain. Diode lasers are usually applied to soft tissues before starting an orthodontic treatment. In some cases, patients are in the need of a frenectomy. If it’s performed with a laser the healing process is very fast and the braces can be applied in only several days after the procedures. Also if there are some teeth that are covered with gum tissue, they can be uncovered with diode lasers. This might be the most common procedure performed with these lasers. Dentists use them to prepare the soft tissue before getting an impression. It is very useful especially for restorations such as crowns and bridges. The procedure takes up to one minute without any pain. It makes the job of dentists much easier and it’s a pleasant experience for patients.